When you decide to retire relocating can become a process. There are many aspects that are involved when choosing a place to live for retirement. One major priority when relocating is the cost of living. You would need to think about monthly expenses that include payments such as a mortgage, utilities, cars, taxes, and whatever other bills you may have. You would also want to think about other miscellaneous expenses such as dining, activities for the week/weekend, groceries, and so forth. When the budget has been put into a firm place, it is then time to think about other aspects of finding the right place to live for retirement. 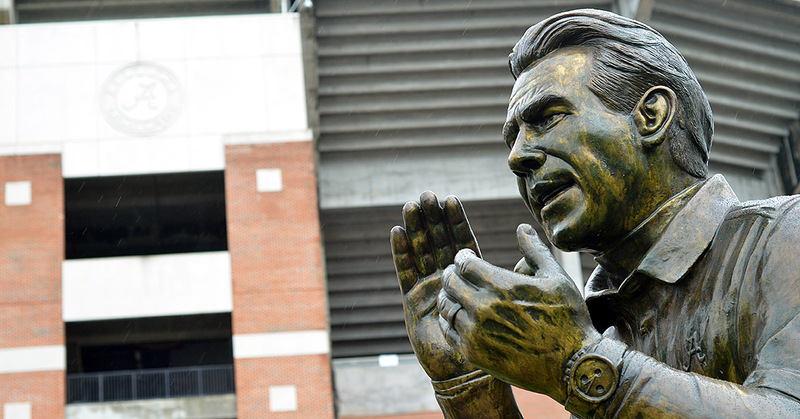 For college football fans, Tuscaloosa is a capital for athletic excellence, as this statue of Coach Nick Saban attests. Seniors who are trying to find a place to live take into consideration the distance there may be between them and their family and friends. One benefit of retiring is having the ability to spend more time with loved ones, but as you get older having to travel for long periods and distances to see family can become a strain. Therefore, finding a place where family and friends are close by or even an airport nearby where you and your family can travel is best. There is no doubt that the cost of living is the top priority when relocating to new a place. While working you are used to living on a monthly income to pay the bills, but with retirement, you have to get accustomed to living on a fixed income. Therefore, choosing the right place to live is important. Tuscaloosa is slightly more expensive than Huntsville, but Alabama football here is the Nation’s best, and according to Bestplaces.net cost of index living, the Median Home Cost is the largest factor in the cost of living difference. Activities are a must during retirement. When deciding where to live, it is advised to research what activities cities have to offer. The majority of cities all have activities to do, but some activities might not be appropriate or enjoyable for seniors. Don’t worry though as Tuscaloosa has plenty of activities for those in retirement. Tuscaloosa is home to the Alabama Museum of Natural History. It is located at the University of Alabama’s Smith Hall. It is the oldest museum in the state of Alabama, as it was founded in 1831. The museum is a must see as the exhibit shows the natural diversity of Alabama from the dinosaur age, the coal age, and the ice age. This museum is definitely one to tour. Capitol Park is another great place to see here in Tuscaloosa. This park is the site of the Alabama capitol that burned down in 1923. The stone foundation and two small columns is a visual reminder of the old capitol building that once stood there from the mid-1800s to early 1900s. If you have a knack for Alabama history, then this is the place to see. Lastly, Mercedes-Benz US International Visitor Center and Factory Tour is one for the car lovers. This exhibit shows the German automaker’s history as well as vintage cars. There are two different tours, the plant tour, which shows how the automobiles are manufactured, and the visitor’s tour, which shows the history of the automobiles. Another major factor when trying to relocate is the climate. While some seniors may be all for the chilly winters, most of them enjoy a warmer climate. Tuscaloosa has warm weather for a fair amount of the seasons but can cool down a bit during the winter months. There are lots of sunny days as well as rainy days, and hardly any snow. A perfect city if this is the climate you are looking to live in. As we near retirement age, the quality of healthcare close by becomes a bigger concern. A little town in the middle of nowhere may offer quietness, but what if an emergency prompts a need for more urgent medical attention? A nice benefit of the Tuscaloosa Regency communities is the staffing we offer by qualified personnel who can respond 24/7 for those with recurring medical needs as well as those who simply like having somebody around to remind them when it’s time to take any prescribed medicines they have. A private house may offer privacy that some crave, but when living in a retirement community, there’s less reliance on the kindness and concern of neighbors to check in to make sure a senior who is living inside hasn’t fallen and broken anything, for example. Even if a senior is fit and independent enough to be self-reliant, we should think ahead in the months and years to come when age does become more of a factor. It’s good to know that if an ambulance is ever needed, the EMT drivers are familiar with where a senior living community is located and how to get there fast to respond immediately. Regency’s residence and service options range from Independent Living to Assisted Living to Memory Care. To learn more about Regency, call us at (205) 752-5500.